It’s the week after Halloween, that makes it officially “Start Thinking About Thanksgiving” time. I’ve already invited my guests and I’m starting to work on my menu. I’ve also created a new category “Thanksgiving” (column on the right) of recipes I’ve already tested and published that would be suitable for the T-day table. There are about 25 recipes in this category such as Gluten-free Dairy-free Cornbread, Crunchy Red Cabbage Salad, Fruited Quinoa Salad with Fresh Ginger Dressing, for dessert there’s Apple Galette, Chocolate Torte, or Maple Glazed Pears. Some of the recipes are very traditional some less; some could use tweaking…for instance the Roasted Chicken recipe is exactly what I will be doing for my turkey, however, I will double or triple the rub, depending on the weight of my bird, and of course, the cooking time will be much longer. I’m planning on using the Tzimmes recipe for my candied sweet potatoes…increasing the potatoes and deleting the carrots and prunes. So go browse and see if any of these recipes inspire your holiday menu and don’t forget to click on “Older Posts” since there are only 10 recipes per page. I’m still inundated with apples and this week I got tomatillos from the CSA too. 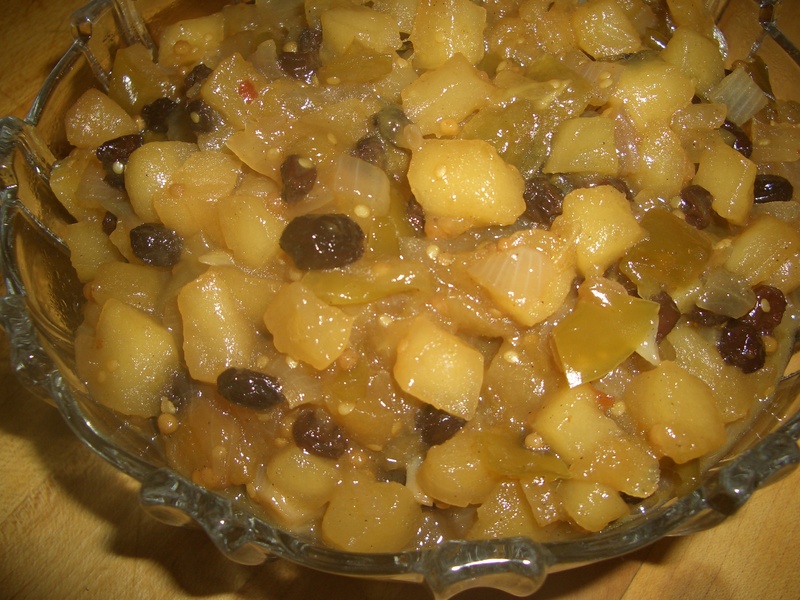 Therefore, this Thanksgiving, in addition to cranberry sauce and/or relish, I’m going to serve Apple Tomatillo Chutney – you can never have too many condiments on the table and this one is really delish. I’m also going with an apple soup instead of squash (look for the recipe next week). There are 2 squash soup recipes I’ve already published if you want to go the more traditional route. So Happy Planning…lots more Thanksgiving ideas/recipes to come. This chutney is great to serve with any roast: turkey, chicken, pork, brisket or pot roast. I even find myself eating it with goat cheese (I know this is a dairy-free site but I happen to be allergic to cow’s milk, I’m okay with goat). 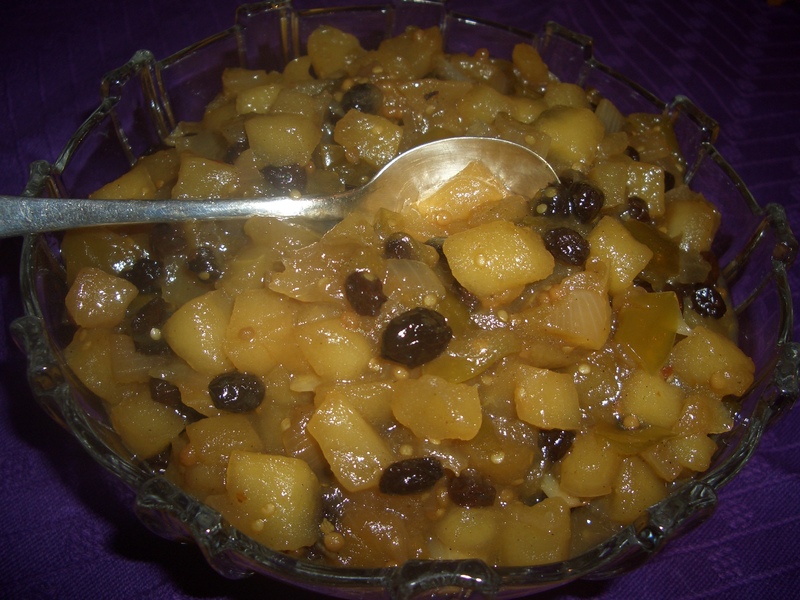 This recipe disappeared in very few days and I was the only one eating it! 1. In a 2-quart pot, heat 1 tablespoon of the oil over medium high heat. 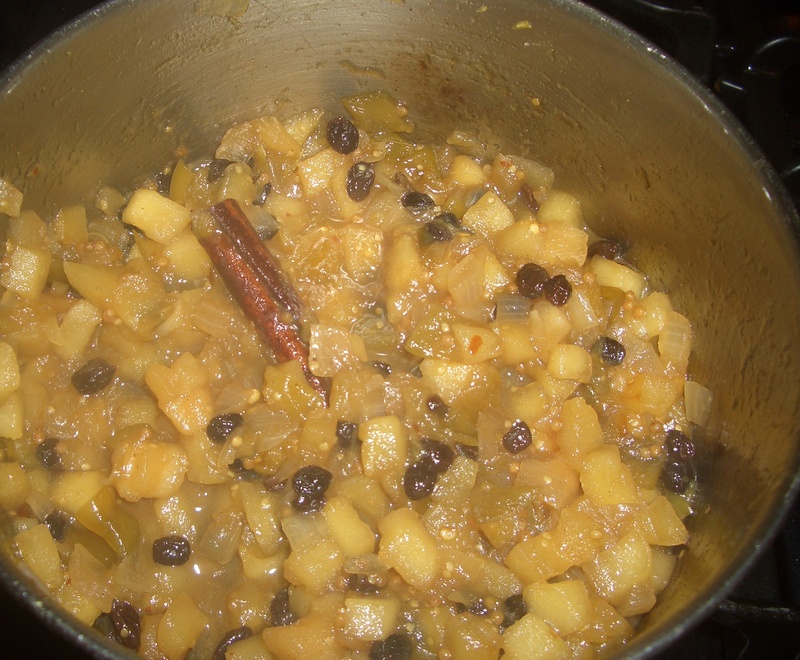 Add the apples and cook, stirring until slightly softened. Remove from pot; set aside. 2. 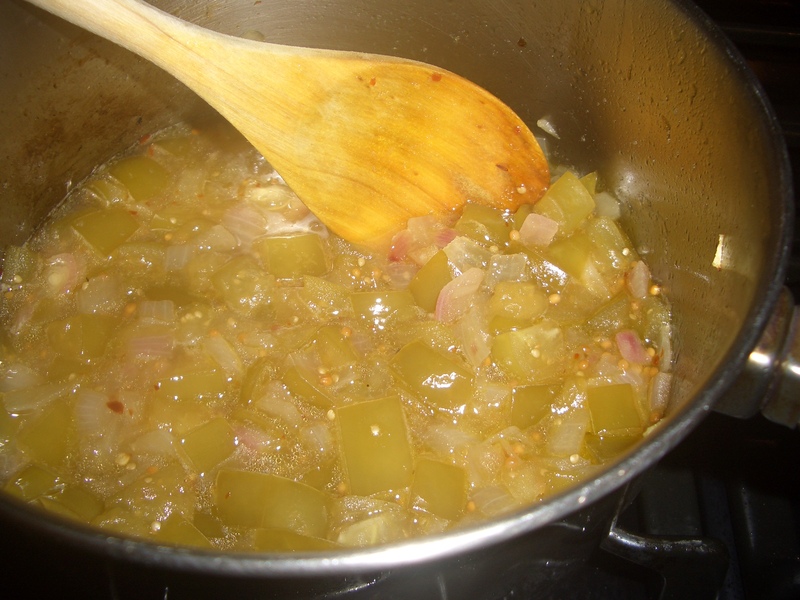 Add the remaining 1 tablespoon of oil to the pot and add the onions. 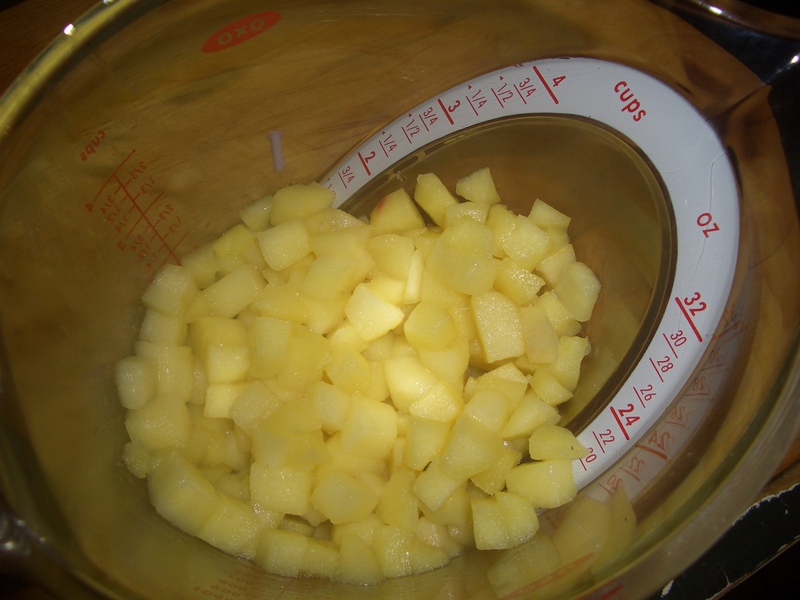 Cook, stirring, until softened. 3. Add the tomatillos, maple syrup, vinegar, mustard seeds, cinnamon stick, cardamom, and pepper flakes. Bring to a boil and cook, uncovered, over medium high heat for 15 minutes. 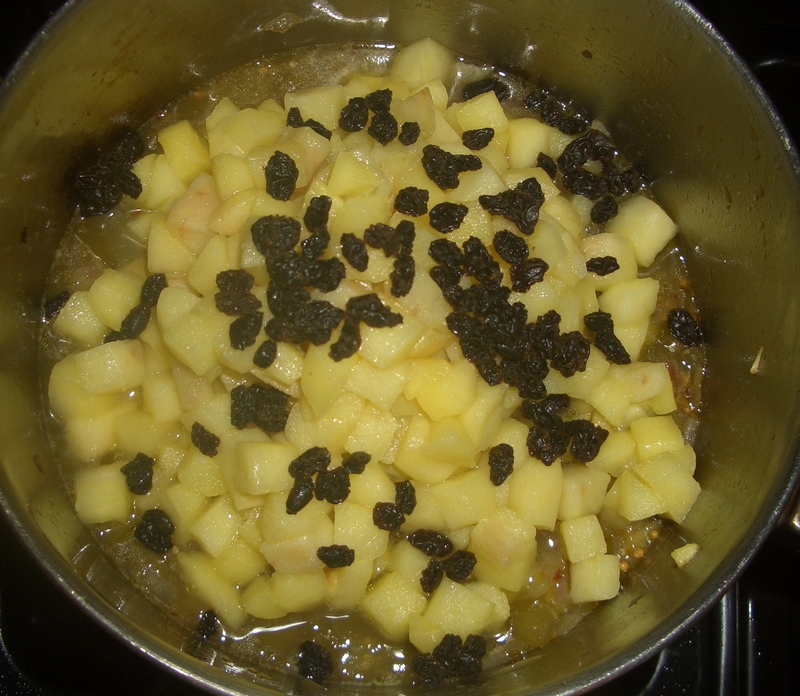 Add the currants and reserved apples. 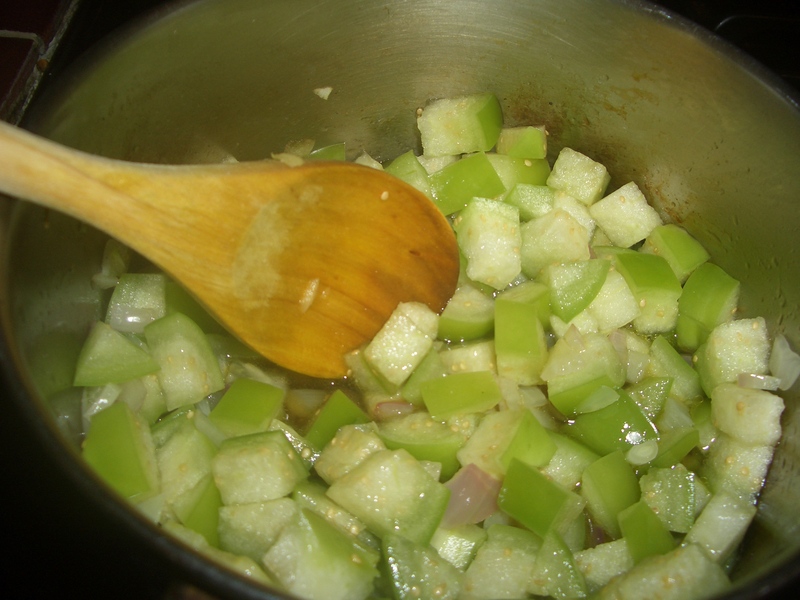 Continue cooking, uncovered, 20 minutes, stirring occasionally, until mixture is thickened and most of the liquid has evaporated. Discard cinnamon stick, if using, and season with salt to taste. Cool. Place in serving bowl or storage container.